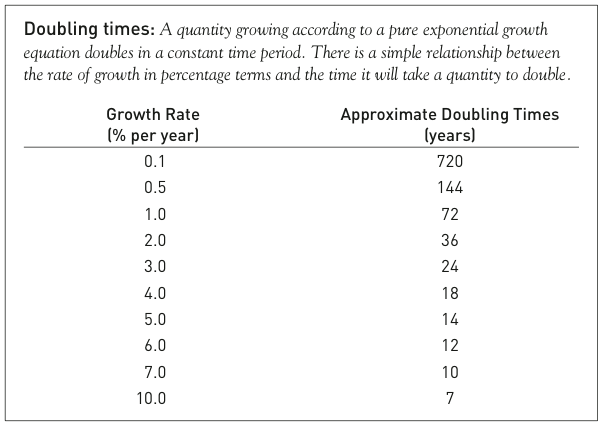 The following piece is a short synopsis of Limits to Growth: The 30-Year Update. The full length book is available at Chelsea Green’s website. We’ve been warned before. More than 30 years ago, a book called The Limits to Growth created an international sensation. Commissioned by the Club of Rome, an international group of businessmen, states- men, and scientists, The Limits to Growth was compiled by a team of experts from the U.S. and several foreign countries. Using system dynamics theory and a computer model called “World3,” the book presented and analyzed 12 scenarios that showed different possible patterns—and environmental outcomes—of world development over two centuries from 1900 to 2100. While the past 30 years has shown some progress, including new technologies, new institutions, and a new awareness of environmental problems, the authors are far more pessimistic than they were in 1972. Humanity has squandered the opportunity to correct our current course over the last 30 years, they conclude, and much must change if the world is to avoid the serious consequences of overshoot in the 21st century. What makes Limits to Growth: The 30-Year Update unique, however, is that it presents the underlying economic structure that leads to these problems. Moreover, Limits is a valuable reference and compilation of data. The authors include 80 tables and graphs that give a comprehen- sive, coherent view of many problems. The book will undoubtedly be used as a text in many courses at the college level, as its two earlier versions have been. The World3 computer model is complex, but its basic structure is not difficult to understand. It is based in system dynamic—a method for studying the world that deals with understanding how complex systems change over time. Internal feedback loops within the structure of the system influence the entire system behavior. World3 keeps track of stocks such as population, industrial capital, persistent pollution, and cultivated land. In the model, those stocks change through flows such as births and deaths; investment and depre- ciation; pollution generation and pollution assimilation; land erosion, land development, and land removed for urban and industrial uses. Feedback loops and nonlinear relationships make World3 dynami- cally complex, but the model is still a simplification of reality. World3 does not distinguish among different geographic parts of the world, nor does it represent separately the rich and the poor. It keeps track of only two aggregate pollutants, which move through and affect the environment in ways that are typical of the hundreds of pollutants the economy actually emits. It omits the causes and consequences of violence. And there is no military capital or corruption explicitly represented in World3. Incorporating those many distinctions, how- ever, would not necessarily make the model better. And it would make it very much harder to comprehend. Readers who want to reproduce the World 3 scenarios of the book can do so themselves, because the authors have prepared interactive World 3 CDs. To order disks, please see back of title page. World3’s core question is, How may the expanding global popula- tion and materials economy interact with and adapt to the earth’s limited carrying capacity over the coming decade? The model does not make predictions, but rather is a tool to understand the broad sweeps and the behavioral tendencies of the system. Resources can be renewable, like agricultural soils, or nonrenew- able, like the world’s oil resources. Both have their limits. The most obvious limit on food production is land. Millions of acres of cultivated land are being degraded by processes such as soil erosion and salinization, while the cultivated area remains roughly constant. Higher yields have compensated somewhat for this loss, but yields cannot be expected to increase indefinitely. Per capita grain production peaked in 1985 and has been trending down slowly ever since. Exponential growth has moved the world from land abundance to land scarcity. Within the last 35 years, the limits, especially of areas with the best soils, have been approached. Another limit to food production is water. In many countries, both developing and developed, current water use is often not sustain- able. In an increasing number of the world’s watersheds, limits have already been reached. In the U.S. the Midwestern Ogalallah aquifer in Kansas is overdrawn by 12 cubic kilometers each year. Its depletion has so far caused 2.46 million acres of farmland to be taken out of cultivation. In an increasing number of the world’s watersheds, limits have already, indisputably, been exceeded. In some of the poorest and richest economies, per capita water withdrawals are going down because of environmental problems, rising costs, or scarcity. A prime example of a nonrenewable resource is fossil fuels, whose limits should be obvious, although many people, including distin- guished economists, are in denial over this elementary fact. More than 80 percent of year 2000 commercial energy use comes from non- renewable fossil fuels—oil, natural gas, and coal. The underground stocks of fossil fuels are going continuously and inexorably down. Between 1970 and 2000, even though billions of barrels of oil and trillions of cubic feet of natural gas were burned, the ratio of known reserves to production actually rose, due to the discovery of new reserves and reappraisal of old ones. Nonetheless the stock of reserves is finite and nonrenewable. Moreover, fossil fuels use is limited by the planet’s capacity to absorb their byproducts after burning, such as the greenhouse gas carbon dioxide. Fossil fuels may be limited by both supply and sinks. Peak gas production will certainly occur in the next 50 years; the peak for oil production will occur much sooner, probably within the next decade. Energy efficiency and renewables offer the best prospect for a sustain- able future. Materials are another finite resource. If population rises, and if those people are to have housing, health services, education, cars, refrigerators, and televisions, they will need steel, concrete, copper, aluminum, plastic, and many other materials. But if an eventual nine billion people on earth all consumed materials at the rate of the average American, world steel production would need to rise by a factor of five, copper by a factor of eight, and aluminum by a factor of nine. From source to sink, the processing, fabricating, handling, and use of materials leaves a trail of pollution. Such materials flows are neither possible nor necessary. Fortunately, growth in materials consumption has slowed, and the prospects for further slowing are good. The possibilities for recycling, greater efficiency, increased product lifetime, and source reduction in the world of materials are exciting. On a global scale, however, they have not yet reduced the vast materials flow through the economy. At best, they have slowed its rate of growth. Another fundamental limit to growth is sinks—the capacity of the planet to absorb the pollution and waste resulting from human economic activity. The most intractable wastes are nuclear wastes, hazardous wastes (like human synthesized chemicals), and greenhouse gases. They are chemically the hardest to sequester or detoxify, and economically and politically the most difficult to regulate. Current atmospheric concentrations of carbon dioxide and methane are far higher than they have been in 160,000 years. It may take decades for the consequences of climate change to be revealed in melting ice, rising seas, changing currents, greater storms, shifting rainfall, and migrating insects, birds or mammals. It is also plausible that climate may change rapidly. Using the World3 computer model, Limits to Growth: The 30-Year Update presents 10 different scenarios for the future, through the year 2100. In each scenario a few numbers are changed to test different estimates of “real world” parameters, or to incorporate optimistic predictions about the development of technology, or to see what happens if the world chooses different policies, ethics, or goals. Most of the scenarios presented in Limits result in overshoot and collapse—through depletion of resources, food shortages, industrial decline, or some combination of these or other factors. Under the “business as usual scenario,” world society proceeds in a traditional manner without major deviation from the policies pursued during most of the 20th century. In this scenario, society proceeds as long as possible without major policy change. Population rises to more than seven billion by 2030. But a few decades into the 21st century, growth of the economy stops and reverses abruptly. As natural resources become harder to obtain, capital is diverted to extracting more of them. This leaves less capital for investment in industrial output. The result is industrial decline, which forces declines in the service and agricultural sectors. About the year 2030, population peaks and begins to decrease as the death rate is driven upward by lack of food and health services. A similar scenario assumes that the world’s endowment of natural resources doubles, and further postulates that advances in resource extraction technologies are capable of postponing the onset of increasing extraction costs. Under this scenario industry can grow 20 years longer. But pollution levels soar, depressing land yields and requiring huge investments in agricultural recovery. The population finally declines because of food shortages and negative health effects from pollution. Other scenarios address the problems of pollution and food short- ages by assuming more effective pollution control technologies, land enhancement (an increase in the food yield per unit of land), and protections against soil erosion. Even a scenario with these features however, results in overshoot and collapse. After 2070 the costs of the various technologies, plus the rising costs of obtaining nonrenewable resources from increasingly depleted mines, demand more capital than the economy can provide. The result is rather abrupt decline. 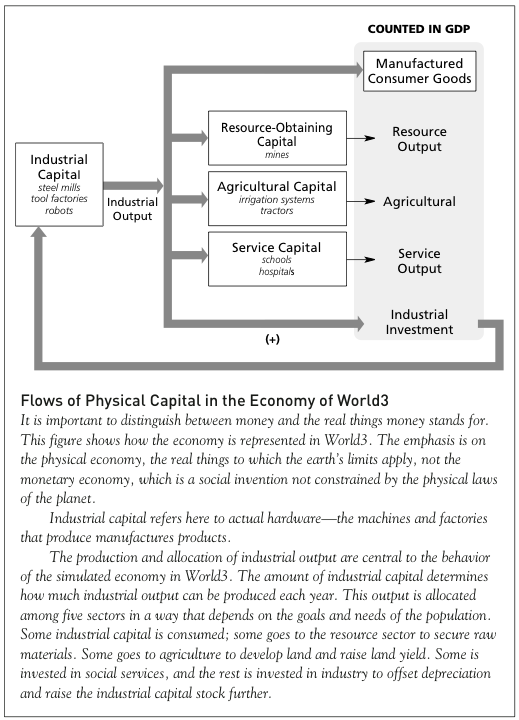 If to this scenario one adds reductions in the amount of nonre- newable resources needed per unit of industrial output (resource efficiency technology), in combination all these features permit a fairly large and prosperous world, until the bliss starts declining in response to the accumulated cost of the technologies. This technology program comes online too late to avoid a gradual decline in human welfare throughout the century. By the end of the 21st century, a stable population of less than eight billion people is living in a high-tech, low pollution world with a human welfare index roughly equal to that of the world of 2000. But industrial output begins to decline around 2040 because the rising expense of protecting the population from starvation, pollution, erosion, and resource shortage cuts into the capital available for growth. Ultimately this simulated world fails to sustain its living standards as technology, social services, and new investment simultaneously become too expensive. The world can respond in three ways to signals that resource use and pollution emissions have gone beyond their sustainable limits. One way is to disguise, deny, or confuse the signals. Generally this takes the form of efforts to shift costs to those who are far away in space and time. An example would be to buy air conditioners for relief from a warming climate, or to ship toxic wastes for disposal in a distant region. A second way is to alleviate the pressures from limits by employ- ing technical or economic fixes. 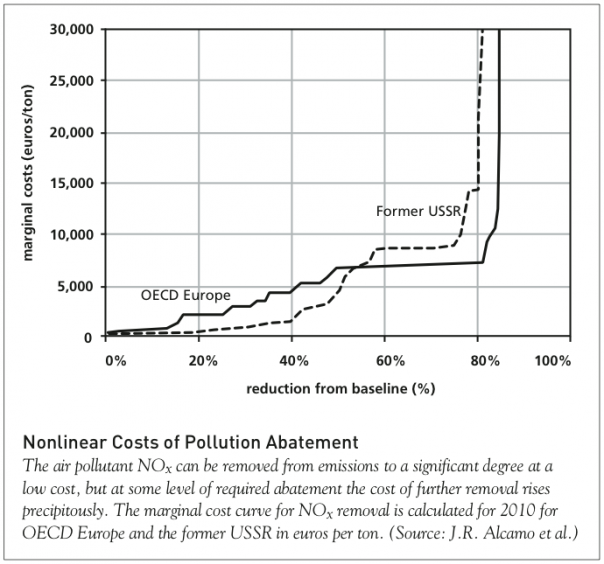 For example, reducing the amount of pollution generated per mile of driving or per kilowatt of electricity generated. These approaches, however, will not eliminate the causes of these pressures. The third way is to work on the underlying causes, to recognize that the socioeconomic system has overshot its limits, is headed toward collapse, and therefore seek to change the structure of the system. World3 can be used to test some of the simplest changes that might result from a society that decides to back down from over- shoot and pursue goals more satisfying and sustainable than perpetual material growth. Scenario 7 supposes that after 2002, all couples decide to limit their family size to two children and have access to effective birth control technologies. Because of age structure momentum, the population continues to grow for another generation. But the slower population growth permits industrial output to rise faster, until it is stopped by rising pollution. Under this scenario, world population peaks at 7.5 billion in 2040. A globally effective, two children policy introduced in 2002 reduces the peak population less than 10 percent. Because of slower population growth, consumer goods per capita, food per capita, and life expectancy are all higher than in the scenario where the world’s endowment of natural resources was doubled. But industrial output peaks in 2040 and declines. The larger capi- tal plant emits more pollution, which has negative effects on agricul- tural production. To sustain food production, capital must be diverted to the agricultural sector. Later on, after 2050, pollution levels are sufficiently high to have negative impacts on life expectancies. But what if the world’s people decide to moderate not only their demand for children, but also their material lifestyles? What if they set a goal for themselves of an adequate but not excessive standard of living? 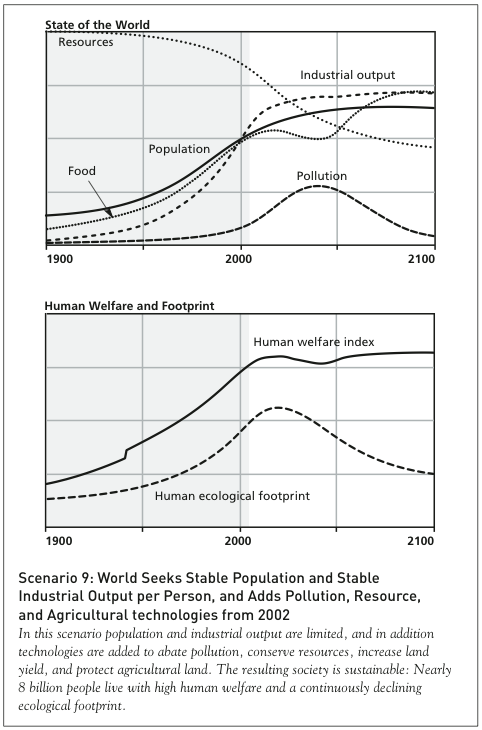 If the model society both adopts a desired family size of two children and sets a fixed goal for industrial output per capita, it can extend somewhat the “golden age” of fairly high human welfare between 2020 and 2040 in the previous scenario. But pollution increasingly stresses agricultural resources. Per capita food production declines, eventually bringing down life expectancy and population. These changes cause a considerable rise in consumer goods and services per capita in the first decade after the year 2002. In fact, they rise higher and faster than they did in the previous run, where industrial growth was not curtailed. But this economy is not quite stabilized. It has an ecological footprint above the sustainable level, and it is forced into a long decline after 2040. The world of Scenario 8 manages to support more than seven billion people at an adequate standard of living for almost 30 years, from 2010 to 2040, but during that time the environment and soils steadily deteriorate. 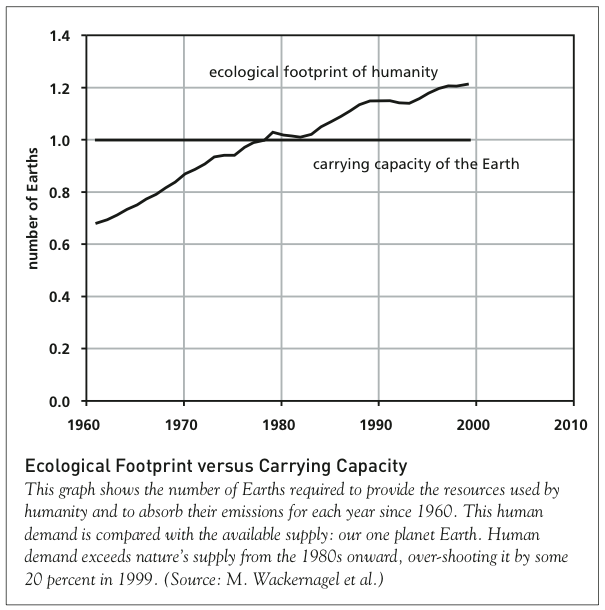 To remain sustainable, the world in this scenario needs to lower its ecological footprint to a level below the carrying capacity of the global environment. Scenario 9: World Seeks Stable Population and Stable Industrial Output per Person, and Adds Pollution, Resource and Agricultural Technologies from 2002. Moving in this direction, in another scenario the world seeks stable population and stable industrial output per person, and adds pollution, resource and agricultural technologies starting in 2002. In this scenario, population and industrial output are limited as in the previous run, and in addition technologies are added to abate pollution, conserve resources, increase land yield, and protect agri- cultural land. The resulting society is sustainable: Nearly eight billion people live with high human welfare and a continuously declining ecological footprint. Under this scenario, the world decides on an average family size of two children and sets modest limits for material production, as in the previous scenario. Further, starting in 2002 it begins to develop, invest in, and employ the technologies that increase the efficiency of resource use, decrease pollution emissions per unit of industrial output, control land erosion, and increase land yields until food per capita reaches its desired level. The society of this scenario manages to begin reducing its total burden on the environment before the year 2020; from that point the total ecological footprint of humanity is actually declining. The system brings itself down below its limits, avoids an uncontrolled collapse, maintains its standard of living, and holds itself very close to equilibrium. In a final scenario, the sustainability policies of the previous scenario are introduced 20 years earlier, in 1982. 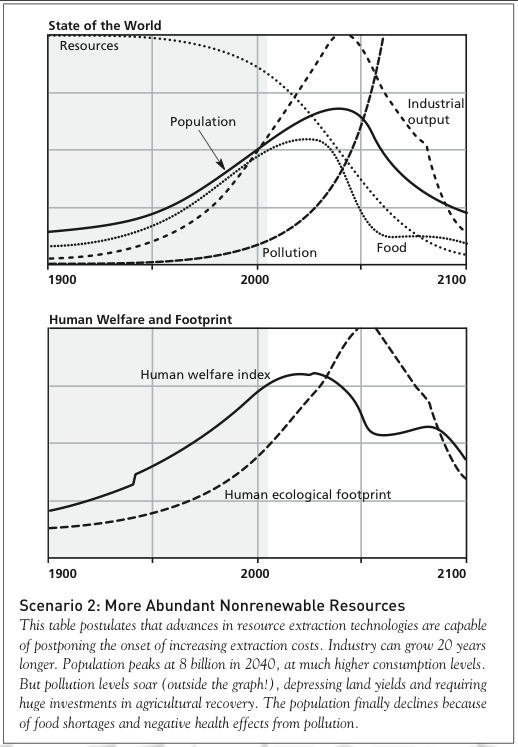 Moving toward sustainability 20 years sooner would have meant a lower final population, less pollution, more nonrenewable resources, and a slightly higher average welfare for all. Under this scenario, population levels off just above six billion instead of eight billion. Pollution peaks at a much lower level and 20 years sooner, and interferes less with agriculture than it did in the previous scenario. Life expectancy surpasses 80 years and remains high. Life expectancy, food per capita, services per capita, and consumer goods per capita all end up at higher levels than they did in the previous scenario. Two general insights from this effort are valid and relevant. The first insight is the realization that waiting to introduce fundamental change reduces the options for humanity’s long-term future. The second insight is that the model world’s goal for industrial goods per capita, even with all the ameliorative technologies, cannot be sustained for the resulting population of more than seven billion. A global transition to a sustainable society is probably possible without reductions in either population or industrial output. A transition to sustainability will require an active decision to reduce the human ecological footprint. There are many choices that can be made about numbers of peo- ple, living standards, technological investment, and allocations among industrial goods, services, food, and other material needs. There are many trade-offs between the number of people the earth can sustain and the material level at which each person can be supported. The longer the world takes to reduce its ecological footprint and move toward sustainability, the lower the population and material standard that will be ultimately supportable. The higher the targets for population and material standard of living are set, the greater the risk of exceeding and eroding its limits. From a systems point of view, a sustainable society is one that has in place informational, social, and institutional mechanisms to keep in check the positive feedback loops that cause exponential population and capital growth. This means that birthrates roughly equal death rates, and investment rates roughly equal depreciation rates, unless or until technical change and social decisions justify a considered, limited change in the levels of population or capital. Such a society, with a sustainable ecological footprint, would be almost unimaginably different from the one in which most people now live. Before we can elaborate on what sustainability could be, we need to start with what it need not be. Sustainability does not mean zero growth. Rather, a sustainable society would be interested in qualitative development, not physical expansion. It would use material growth as a considered tool, not a perpetual mandate. Neither for nor against growth, it would begin to discriminate among kinds of growth and purposes for growth. It would ask what the growth is for, and who would benefit, and what it would cost, and how long it would last, and whether the growth could be accommodated by the sources and sinks of the earth. A sustainable society would also not paralyze into permanence the current inequitable patterns of distribution. For both practical and moral reasons, a sustainable society must provide sufficiency and security for all. A sustainable society would not be a society of despon- dency and stagnation, unemployment and bankruptcy that current systems experience when their growth is interrupted. A deliberate transition of sustainability would take place slowly enough, and with enough forewarning, so that people and businesses could find their places in the new economy. A sustainable world would also not be a rigid one, with population or production or anything else held pathologically constant. One of the strangest assumptions of present-day mental models is the idea that a world of moderation must be one of strict, centralized government control. A sustainable world would need rules, laws, standards, bound- aries, social agreements and social constraints, of course, but rules for sustainability would be put into place not to destroy freedoms, but to create freedoms or protect them. Some people think that a sustainable society would have to stop using nonrenewable resources. But that is an over-rigid interpretation of what it means to be sustainable. Certainly a sustainable society would use nonrenewable gifts from the earth’s crust more thoughtfully and efficiently. Extend the planning horizon. Base the choice among current options much more on their long-term costs and benefits. Improve the signals. Learn more about the real welfare of human population and the real impact on the world ecosystem of human activity. Speed up response time. Look actively for signals that indicate when the environment or society is stressed. Decide in advance what to do if problems appear. Minimize the use of nonrenewable resources. Prevent the erosion of renewable resources. Use all resources with maximum efficiency. Slow and eventually stop exponential growth of population and physical capital. The necessity of taking the industrial world to its next stage of evolution is not a disaster—it is an amazing opportunity. How to seize the opportunity, how to bring into being a world that is not only sustainable, functional, and equitable but also deeply desirable is a question of leadership and ethics and vision and courage, properties not of computer models but of the human heart and soul. Jorgen Randers is professor and former President of the Norwegian School of Management. He is also former Deputy Director General of World Wildlife Fund International. He lives in Oslo, Norway. Dennis Meadows has served on the faculties and directed research centers at MIT, Dartmouth College, and the University of New Hampshire. He is President of the Laboratory for Interactive Learning. He lives in Durham, New Hampshire.